A few autumns ago, one of the frequent visitors to our gone-wild apple orchard was a lopsided, one-point buck. We often see does and young, antlerless deer in the field, and by the end of each fall we’re able to identify many of them by size, appearance, and the company they keep. Bucks, however, are a rare sighting. This one came to the apples often, and I wondered how he’d come to have a single antler. I also wondered how bucks manage to grow new antlers every year, a process that strikes me as exhausting, never mind carrying those heavy-looking protuberances around for months. Antlers, it turns out, are for more than show. They are used to communicate dominance and health and to secure breeding. When they’re dropped in the winter, antlers become useful as food for other animals. Squirrels, mice, porcupines, and even coyotes nosh on dropped antlers, which are a source of essential nutrients like calcium and phosphorus. The fastest growing bones of any mammal — they reach full size in a matter of a months — antlers’ annual growth is triggered by hormone changes, which are in turn triggered by seasonal changes in daylight. The lengthening days of springtime prompt antlers to emerge and grow by as much as a half inch per day. That hormone change leads to the hardening of antlers, as the blood supply is terminated. The bone dries and the velvet dries up and either falls off or is rubbed off. After the rut, bucks drop their antlers and the process begins all over again. In their first summer, buck fawns develop pedicles, the attachment points on their skulls from which antlers will emerge each year. How large their antlers grow in subsequent years depends on a few factors: age, genetics, and nutrition. While young deer are still growing to full size, the nutrients they consume are used primarily for body development rather than antler growth. While antler size for fully-grown bucks is typically about eight points, the point count can be much higher, as evidenced by the 24-point non-typical buck shot in New Hampshire last year. Antler size is one feature bucks use to demonstrate dominance. And more dominant bucks tend to have greater access to does. Bucks will lock antlers to fight for breeding rights during the rut. Beyond visually and physically demonstrating dominance, antlers can also assist in scent communication. When bucks rub their antlers on saplings, they’re not just removing velvet, they are also marking their territory. They mark the scored wood with scent glands located on their foreheads and around their eyes. Rutting bucks will also sometimes urinate on or around their antler rubs. The scent is carried on the breeze, relaying their presence and vitality to both does in estrus and rivals. As for our one-point buck, there could be a variety of reasons for his lopsided appearance, Bergeron explained. He could have dropped the other spike early, or an injury to his pedicle could have resulted in no antler growth on that side. 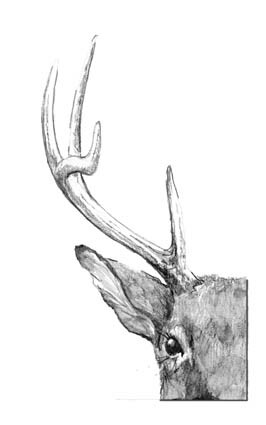 One of the more intriguing suggestions is that an injury to the buck’s hind leg resulted in abnormal growth to the antler on the opposite side. That correlation is likely because nerve pathways cross in the brain, Bergeron said. A large buck who passed through our apple orchard that fall didn’t seem to have such issues. On the day after the close of hunting season, this 8-pointer, whom we’d not seen before, strolled casually through the field. It was as if he knew he was safe now, having survived the fall, antlers and life intact.